Philadelphia – Partnership. Humility. Solidarity. Possibility. These are words used to describe outcomes and results from the Mobilizing Action for Resilient Communities (MARC) convening that was held in March of 2017. The convening brought together community leaders in the trauma-informed movement from 14 networks in 14 states. Participants discussed their projects, shared their ideas, and learned from each other at the two day event in Philadelphia. The purpose of the convening was to bring MARC networks together to deepen relationships, share successes and challenges, identify the impact of these networks on their community and plan for the future. “It’s just so rare for people to have the chance to step away from their day-to-day responsibilities, to have a space for reflection and to really devote time to building relationships,” said Clare Reidy, MARC Program Manager with the Health Federation of Philadelphia (HFP). “MARC is a learning collaborative. Its purpose is to build movements. Movements depend on relationships, and this space was a driver for that relationship development. MARC began in 2015 with support from the Robert Wood Johnson Foundation and The California Endowment; it is coordinated by HFP. The 14 MARC network site members represent communities from cities, counties, regions and states who all work to bring the science of Adverse Childhood Experiences (ACEs) into practice. They raise awareness, inform policy and systems change, and provide training in ACEs, trauma-informed practices and fostering community resilience. As a learning collaborative, the MARC communities share notes, identify best practices and work together to develop ways to gauge the impact of their work. The recent MARC convening is just one way the group shares their experiences together. In addition to relationship building, the MARC convening focused on policy and systems change, impact and indicators, and sustainability. Seven themes emerged from the convening conversations. These will be included in a brief that MARC plans to release by the end of April to help other communities learn and grow from their discussion. 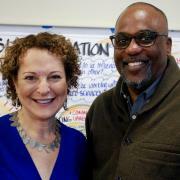 The meeting was facilitated by Ilene Wasserman, PhD, and Jeffrey Branch, EdD from ICW Consulting Group. It was trauma-informed in its approach, and incorporated the work many of the communities have implemented. Instead of traditional breaks, volunteers modeled some of the engagement strategies they use within their own networks. The breaks mixed art, meditation and movement. Each network also participated in one-on-one peer coaching sessions. As a grant-funded project, MARC is scheduled to conclude in November of 2017. The hope is that the project will continue. For more information about MARC, visit the MARC website. For the latest updates on MARC communities, visit the MARC community pages.